In the Japanese archipelago, 20 years into the future, an outbreak of canine influenza spreads throughout the city of Megasaki, with a risk of crossing to humans. The city's 6-term authoritarian mayor, Kenji Kobayashi, authorizes a decree banishing all dogs to Trash Island, which is officially approved after his political party rejects the insistence of professional scientist and political opponent Professor Watanabe that he is close to developing a serum for the dog flu. The first dog officially deported from the city is a white and black-marked pink-nosed dog named Spots Kobayashi, who served as the bodyguard of 12-year-old Atari Kobayashi, the orphaned distant-nephew and ward of the mayor. But this is gradually revealed to be part of a conspiracy by Kobayashi and his political party, who are seeking to finish what their ancestors attempted long ago in removing dogs from Japan. Six months later, Atari hijacks a plane and flies it to Trash Island to search for Spots. After crash-landing, Atari is rescued by a pack of dogs led by an all-black dog named Chief, who is a former stray. The pack decides to help Atari locate Spots, although Chief refuses to join because of his inability to fraternize with humans. Together, they fend off a rescue team accompanied by a band of robot dogs that Kobayashi sent to retrieve Atari. Kobayashi claims Atari was kidnapped by the dogs and vows to kill them as punishment. At the insistence of a female purebred ex-show dog named Nutmeg, Chief reluctantly decides to accompany the group on their search. During their journey, while the dogs reminisce on the foods their owners once fed them, Chief admits that he was once owned by a family, until he bit the youngest child out of fear. They seek advice from two sage dogs, Jupiter and Oracle, who warn them of the existence of an isolated tribe of dogs rumored to be cannibals. Meanwhile, Professor Watanabe develops a serum and shows the results to Kobayashi, who still refuses to lift the dog ban. The professor is put on house arrest for criticizing Kobayashi and is then killed by poisoned wasabi in sushi. An American exchange student, Tracy Walker, suspects a conspiracy and begins to investigate. During the journey, Chief and Atari are separated from the others. Atari gives Chief a bath, which reveals that his coat is actually white with black markings. Noticing the similarity between Chief and Spots (the distinction being that Chief has a black nose), Atari realizes they both must be of the same extremely rare breed: short-haired Oceanic specked-ear/sport hound mix. Chief remembers being part of a nine-dog litter of which all but one died. He bonds with Atari as they continue their journey. They rejoin the group, but are ambushed by Kobayashi's men. Spots then arrives at the last second and leads the strays in fending off the assailants before they and Atari's group escape together, causing Kobayashi in publicly announcing Atari to be dead. Spots confirms that he is Chief's older brother by five minutes, and reveals that he was rescued by the tribe, who were not actually cannibals, became their leader and mated with a female dog named Peppermint, whom is currently pregnant with their first litter. Because of these circumstances, Spots asks permission to transfer his protection duties for Atari to Chief, which Chief grants. An owl brings word that Kobayashi plans to order the extermination of all dogs on Trash Island and replace them with the robot dogs. Atari and the dogs prepare their journey to the mainland. Tracy confronts Watanabe's former colleague Yoko Ono, who confirms Tracy's suspicions and gives her the last remaining vial of the serum. At his re-election ceremony, Kobayashi prepares to give the order when Tracy presents her evidence of his corruption. But Kobayashi dismisses Tracy's evidence as foreign propaganda and orders her immediate deportation back to the United States. Chief, Atari and the dogs soon arrive, and confirm the cure works. Atari then presents a haiku, dedicated to Kobayashi, that signifies the sympathy that previously existed between dogs and humans. Kobayashi has a change of heart and revokes the decree to allow dogs back into Japan, but right-hand Major Domo is enraged at Kobayashi for reneging on his campaign promise and is left with no choice but to trigger the extermination. A fight ensues with Kobayashi and Domo in which the "execute" button is pressed, but the poison backfires on the captors thanks to the help of a hacker from Tracy's high school, which in turn causes the extermination electronics to malfunction and abruptly shut down. During the fight, Atari and Spots are gravely injured by one of the robot dogs. Spots loses an eye and a leg, and is knocked unconscious. Atari's remaining kidney fails, but a regretful Kobayashi donates one of his own to save his nephew. Atari becomes mayor of Megasaki due to a ruling and he decrees the dogs' reintegration into society while Kobayashi and his co-conspirators (including Major Domo) are jailed for their corruption. Tracy and Atari become a couple, and Chief reunites with Nutmeg and takes up the role of Atari's bodyguard. Meanwhile, Spots, assumed to be dead and now having had most of his injuries treated, secretly resumes raising his litter with Peppermint in the basement of the Kobayashi manor. In October 2015, Anderson, who had previously directed the animated film Fantastic Mr. Fox, announced he would be returning to the art form with "a film about dogs" starring Edward Norton, Bryan Cranston and Bob Balaban. Anderson has said that he was inspired by seeing a road sign for the Isle of Dogs in England while Fantastic Mr. Fox was in development. Anderson said that the film was strongly influenced by the films of Akira Kurosawa, as well as the stop-motion animated holiday specials made by Rankin/Bass Productions. Production began in October 2016 at the 3 Mills Studios in East London. The animation department included a number of people who had worked on Fantastic Mr. Fox. 20,000 faces and 1,105 animatable puppets were crafted by "12 sculptors working six days a week" for the film. 2,000 more puppets were made for background characters. The detailed puppets of the main characters took an average of two to three months to create. Concurrently with the film, Félix and Paul Studios and FoxNext VR Studio collaborated on Isle of Dogs: Behind the Scenes (in Virtual Reality), an immersive video film which places the viewer directly inside the animated world. The virtual reality film was released on the Google Pixel platform. On December 23, 2016, Fox Searchlight Pictures acquired worldwide distribution rights to the film, with plans for a 2018 release. A trailer was released on September 21, 2017. The film premiered as the opening film of the 68th Berlin International Film Festival on February 15, 2018, and had its North American premiere as the closing film of the SXSW Film Festival in Austin, Texas, on March 17, 2018. 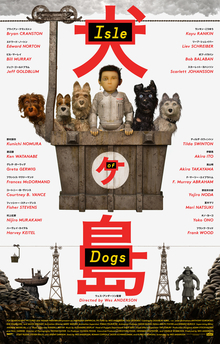 Isle of Dogs began a limited release in the U.S. on March 23, 2018. It was released nationwide in the United States on April 13, 2018. Isle of Dogs was released on digital on June 26, 2018, and on DVD and Blu-ray on July 17, 2018. In its first weekend of limited release, the film made $1.57 million from 27 theaters (an average of $58,148 per venue). It was the best per-theater average of 2018 until it was overtaken by Eighth Grade in July. Sixty percent of its audience was under the age of 30. In its second weekend the film made $2.8 million from 165 theaters (an increase of 74 percent), finishing 11th. The film entered the top 10 in its third weekend, making $4.6 million from 554 theaters. The film expanded to 1,939 theaters the following week and made $5.4 million, finishing 7th at the box office. On review aggregation website Rotten Tomatoes, the film holds an approval rating of 90% based on 323 reviews, and an average rating of 8.04/10. The website's critical consensus reads, "The beautifully stop-motion animated Isle of Dogs finds Wes Anderson at his detail-oriented best while telling one of the director's most winsomely charming stories." On Metacritic, which assigns normalized ratings to reviews, the film has a weighted average score of 82 out of 100, based on 55 critics, indicating "universal acclaim." Audiences polled by CinemaScore gave the film an average grade of "A" on an A+ to F scale, while PostTrak reported filmgoers gave it an overall positive score of 88 percent. Richard Roeper of the Chicago Sun-Times gave the film 3.5 out of 4 stars, praising it for taking risks, and saying: "It's smart and different and sometimes deliberately odd and really funny—rarely in a laugh-out-loud way, more in a smile-and-nod-I-get-the-joke kind of way." Some critics have argued that the film is an example of racial stereotyping and cultural appropriation, and that one of its characters aligns with the trope of the "white savior". The Japanese characters speak unsubtitled Japanese, with their dialogue instead being translated by an interpreter or a machine. Justin Chang of the Los Angeles Times wrote "It's in the director's handling of the story's human factor that his sensitivity falters, and the weakness for racial stereotyping that has sometimes marred his work comes to the fore ... Much of the Japanese dialogue has been pared down to simple statements that non-speakers can figure out based on context and facial expressions". Angie Han, writing in Mashable, calls the American exchange student character Tracy a "classic example of the 'white savior' archetype—the well-meaning white hero who arrives in a foreign land and saves its people from themselves". While this critique has created some furore on the film's release, Chang has said that his review had been taken out of context and turned into a "battle cry" on Twitter, adding, "I wasn't offended; nor was I looking to be offended". Another Japanese-American perspective was provided by Emily Yoshida, writing in New York magazine, that these concerns had been "seen before in debates about Asian culture as reflected by Western culture—perspectives can vary wildly between Asian-Americans and immigrated Asians, and what feels like tribute to some feels like opportunism to others". Writing for BuzzFeed, Alison Willmore found "no overt malicious intent to Isle of Dogs' cultural tourism, but it's marked by a hodgepodge of references that an American like Anderson might cough up if pressed to free associate about Japan—taiko drummers, anime, Hokusai, sumo, kabuki, haiku, cherry blossoms, and a mushroom cloud (!). ... This all has more to do with the ... insides of Anderson's brain than it does any actual place. It's Japan purely as an aesthetic—and another piece of art that treats the East not as a living, breathing half of the planet but as a mirror for the Western imagination". She continued, "in the wake of Isle of Dogs' opening weekend, there were multiple headlines wondering whether the film was an act of appropriation or homage. But the question is rhetorical—the two aren't mutually exclusive, and the former is not automatically off the table just because the creator's intent was the latter". Anderson's decision not to subtitle the Japanese speakers struck me as a carefully considered artistic choice. Isle of Dogs is profoundly interested in the humor and fallibility of translation ... This is the beating heart of the film: there is no such thing as "true" translation. Everything is interpreted. Translation is malleable and implicated, always, by systems of power ... [the film] shows the seams of translation, and demarcates a space that is accessible—and funny—only to Japanese viewers. At a climactic moment, the movie rejects the notion of universal legibility, placing the onus of interpretation solely upon the American audience ... This is a sly subversion, in which the Japanese evince an agency independent of foreign validation. Indeed, to say that the scene dehumanizes the Japanese is to assume the primacy of an English-speaking audience. Such logic replicates the very tyranny of language that Isle of Dogs attempts to erode. The film's score was composed by Alexandre Desplat, who had previously worked with Anderson on Fantastic Mr. Fox, Moonrise Kingdom, and The Grand Budapest Hotel. The soundtrack also features various original and selected songs from a variety of musicians, mainly from Japan. Some songs had origins in classic Japanese cinema such as the Akira Kurosawa films Drunken Angel (1948) and Seven Samurai (1954). The soundtrack comprises 22 tracks in total, 15 of which were composed by Desplat. All tracks written and performed by Alexandre Desplat, except where noted. ^ Also for his work in Endangered Species, Suburbicon, The Shape of Water, and Valerian and the City of a Thousand Planets. ^ a b "Isle of Dogs (PG)". British Board of Film Classification. March 20, 2018. Retrieved June 1, 2018. ^ Lodge, Guy (February 15, 2018). "Film Review: 'Isle of Dogs'". Variety. Penske Business Media. Retrieved March 23, 2018. ^ "British Council Film: Isle of Dogs". British Film Directory. British Council. Retrieved March 23, 2018. ^ "'Isle Of Dogs': Berlin Review". Screen Daily. Screen International. February 16, 2018. Retrieved March 23, 2018. ^ a b c d e f g h i j k l m n o p q r s t "Isle of Dogs (2018)". British Film Institute. Retrieved March 15, 2018. ^ a b "Isle of Dogs (2018)". Box Office Mojo. Retrieved August 26, 2018. ^ "望月ミネタロウ「犬ヶ島」コミカライズがモーニングで始動、表紙は大友克洋" [Minetarō Mochizuki "Inugashima" comicalize starting in Morning, cover is Katsuhiro Ōtomo]. Natalie. May 24, 2018. Retrieved July 20, 2018. ^ Rafael Antonio Pineda (April 20, 2018). "Dragon Head's Minetarō Mochizuki draws Isle of Dogs manga". Anime News Network. Retrieved July 21, 2018. ^ a b c "Isle of Dogs". Annual Archives: 2018. Berlin International Film Festival. Retrieved February 23, 2018. ^ a b "Isle of Dogs official website". Fox Searchlight Pictures. Retrieved March 21, 2018. ^ Osborn, Alex (October 12, 2015). "Wes Anderson to Direct Stop-Motion Animated Film About Dogs". IGN UK. Ziff Davis. Retrieved March 23, 2018. ^ Casey, Dan (October 12, 2015). "Exclusive: Jeff Goldblum, Bryan Cranston, and More to Star in Wes Anderson's Stop-Motion Animated Dog Movie". Nerdist. Retrieved December 21, 2016. ^ Perez, Rodrigo (October 9, 2015). "Wes Anderson's Next Movie Is A Stop-Motion Animated Film About Dogs; May Also Do An Anthology Movie". The Playlist. Penske Business Media. Retrieved December 21, 2016. ^ Buxton, Adam (March 31, 2018). "EP.70 - GARTH JENNINGS & WES ANDERSON". The Adam Buxton Podcast. Retrieved July 20, 2018. ^ Sharf, Zach (March 13, 2017). "Wes Anderson's 'Isle of Dogs' is Inspired By Akira Kurosawa and Christmas Television Specials". IndieWire. Penske Business Media. Retrieved March 17, 2017. ^ Cabin, Chris (October 27, 2016). "Wes Anderson Confirms His Stop-Motion Animated Dog Movie Is In Production". Collider. Complex Media. Retrieved December 21, 2016. ^ Hayes, Britt (October 27, 2016). "Wes Anderson Is Currently Filming His New Stop-Motion Animated Movie About Dogs". Screen Crush. Townsquare Media. Retrieved October 27, 2016. ^ "Isle of Dogs". 3 Mills Studios. Retrieved April 6, 2018. ^ James, Nick (April 2018). "Where Beagles Dare". Sight & Sound. British Film Institute. Retrieved July 20, 2018. ^ Murphy, Jackson. "INTERVIEW with 'Isle Of Dogs' Stop-Mo Model Maker Andy Gent." Animation Scoop. 29 October 2018. 29 October 2018. ^ "These VR masters are bringing Wes Anderson's vision to life — and changing how we experience movies". CBC Arts, January 22, 2018. ^ "Wes Anderson's 'Isle of Dogs' VR mock-doc is live on Pixel phones". Engadget, February 16, 2018. ^ Tartaglione, Nancy (December 22, 2016). "Fox Searchlight Takes World Rights On Wes Anderson's 'Isle Of Dogs'". Deadline Hollywood. Penske Business Media. Retrieved December 22, 2016. ^ Grater, Tom (December 22, 2016). "Fox Searchlight takes world rights to Wes Anderson's 'Isle Of Dogs'". Screen Daily. Screen International. Retrieved December 22, 2016. ^ Fox Searchlight Pictures (September 21, 2017). ISLE OF DOGS | Official Trailer | FOX Searchlight. YouTube. Retrieved April 19, 2018. ^ Galuppo, Mia (February 7, 2018). "SXSW: Wes Anderson's 'Isle of Dogs' to Close Festival". The Hollywood Reporter. Prometheus Global Media. Retrieved March 18, 2018. ^ Smith, Nigel M. (April 25, 2017). "Wes Anderson's 'Isle of Dogs' Gets Release Date, Poster (Photo)". TheWrap. Retrieved April 25, 2017. ^ a b Rubin, Rebecca (March 25, 2018). "Wes Anderson's 'Isle of Dogs' Prances to Top Screen Average of 2018". Variety. Penske Business Media. Retrieved March 31, 2018. ^ Brooks, Brian (March 23, 2018). "Wes Anderson Returns With 'Isle Of Dogs'; Stanley Tucci Back With 'Final Portrait' – Specialty B.O. Preview". Deadline Hollywood. Penske Business Media. Retrieved March 24, 2018. ^ James (March 20, 2018). "UPDATE: Isle of Dogs is getting a wide release in the coming weeks". Animated Views. Retrieved March 24, 2018. ^ "Isle of Dogs (2018)". DVDs Release Dates. Retrieved August 21, 2018. ^ Rubin, Rebecca (July 15, 2018). "'Eighth Grade' Rules Indie Box Office With Top Screen Average of 2018". Variety. Penske Business Media. Retrieved July 17, 2018. ^ a b D'Alessandro, Anthony (March 25, 2018). "Does 'Pacific Rim: Uprising' Break Even At The Global B.O.? ; 'Black Panther' Sets Marvel Record – Sunday Postmortem". Deadline Hollywood. Penske Business Media. Retrieved March 25, 2018. ^ D'Alessandro, Anthony (April 8, 2018). "'A Quiet Place' Screams To $50M+ Opening; 'Blockers' Breaks Through To $21M+ – Early Sunday Update". Deadline Hollywood. Penske Business Media. Retrieved April 8, 2018. ^ D'Alessandro, Anthony (April 15, 2018). "The Rock Rebounds: 'Rampage' Shushes 'A Quiet Place' With $34M+ No. 1 Opening". Deadline Hollywood. Penske Business Media. Retrieved April 15, 2018. ^ "Isle of Dogs (2018)". Rotten Tomatoes. Fandango Media. Retrieved August 27, 2018. ^ "Isle of Dogs Reviews". Metacritic. CBS Interactive. Retrieved April 11, 2018. ^ D'Alessandro, Anthony (April 13, 2018). "Dwayne Johnson Ape Movie 'Rampage' Grabs $2.4M In Thursday Previews". Deadline Hollywood. Penske Business Media. Retrieved April 13, 2018. ^ Roeper, Richard (March 27, 2018). "'Isle of Dogs': Wes Anderson finds beauty in exiled pups, sick but soulful". Chicago Sun-Times. Retrieved April 1, 2018. ^ a b Clift, Tom (March 25, 2018). "Wes Anderson's 'Isle Of Dogs' Has Been Accused Of Cultural Appropriation". Junkee. Junkee Media. Retrieved March 28, 2018. ^ Telegraph Reporters (March 22, 2018). "Wes Anderson's Isle of Dogs sparks controversy over depiction of Japan". The Telegraph. Telegraph Media Group. Retrieved March 28, 2018. ^ Yoshida, Emily (March 29, 2018). "What It's Like to Watch Isle of Dogs As a Japanese Speaker". Vulture. New York Media. Retrieved April 25, 2018. ^ a b Willmore, Alison (April 5, 2018). "Orientalism Is Alive And Well In American Cinema". BuzzFeed News. BuzzFeed. Retrieved April 5, 2018. ^ a b Fujii, Moeko (April 13, 2018). "What Wes Anderson's "Isle Of Dogs" Gets Right About Japan". The New Yorker. Condé Nast. Retrieved April 13, 2018. ^ "Alexandre Desplat – Isle Of Dogs (Original Soundtrack)". Discogs. Retrieved April 13, 2018. ^ Bryan, Jon (March 27, 2018). "Album Review: Isle of Dogs – Original Soundtrack". Backseat Mafia. Retrieved April 13, 2018. ^ Goggins, Joe (April 11, 2018). "Album Review: Various - Isle Of Dogs (Original Soundtrack)". Drowned in Sound. Retrieved April 13, 2018. ^ Marsh, Calum (March 28, 2018). "Various Artists: Isle of Dogs (Original Soundtrack) Album Review". Pitchfork. Retrieved April 13, 2018. ^ Kate, Ben (March 23, 2018). "Wes Anderson releases Isle of Dogs soundtrack, featuring score from Alexandre Desplat: Stream". Consequence of Sound. Retrieved April 13, 2018. ^ "Oscar Nominations 2019: The Complete List". Variety. January 22, 2019. ^ "2018 EDA Award Winners - Alliance of Women Film Journalists Newsok". Retrieved January 12, 2019. ^ "46th Annual Annie Awards" (Press release). Annie Awards. December 3, 2018. Archived from the original on December 3, 2018. Retrieved December 3, 2018. ^ "'Black Panther,' 'Crazy Rich Asians' Among Art Directors Guild Award Nominees". The Hollywood Reporter. January 7, 2019. Archived from the original on January 7, 2019. Retrieved January 7, 2019. ^ "Atlanta Film Critics Circle Announces Its 2018 Winners". Atlanta Film Critics Circletype=Press release. December 8, 2018. Archived from the original on December 8, 2018. Retrieved December 6, 2018. ^ "Competition: Competition And Berlinale Special Are Complete" (Press release). Berlin International Film Festival. February 6, 2018. Archived from the original on September 3, 2018. Retrieved February 24, 2018. ^ Martin, Michelle (February 25, 2018). Maclean, William (ed.). "'Touch Me Not' wins Golden Bear top prize at Berlin film festival". Berlin: Reuters. Thomson Reuters. Archived from the original on June 19, 2018. Retrieved February 25, 2018. ^ ""Roma," "The Favourite" and "A Star is Born" lead 2018 CFCA nominations" (Press release). Chicago Film Critics Association Awards. December 7, 2018. Archived from the original on December 8, 2018. Retrieved February 6, 2019. ^ Giardina, Carolyn (January 8, 2019). "'A Star Is Born,' 'Bohemian Rhapsody' Among CAS Sound Mixers Award Nominees". The Hollywood Reporter. Archived from the original on January 8, 2019. Retrieved January 8, 2019. ^ "DFW FILM CRITICS NAME "A STAR IS BORN" BEST PICTURE OF 2018". Dallas–Fort Worth Film Critics Association - Wikipedia (Press release). December 20, 2018. Retrieved December 17, 2018. ^ "'THE FAVOURITE' LEADS 2018 FLORIDA FILM CRITICS AWARDS NOMINATIONS". Florida Film Critics Circle Awards (Press release). December 20, 2018. Retrieved December 19, 2018. ^ Xu, Linda (6 December 2018). "Golden Globe Nominations: Complete List". Retrieved 6 December 2018. ^ "Nominees For 19th Annual Golden Trailer Awards Recognize And Celebrate The Best In Motion Picture Trailers And Television Marketing" (Press release). Beverly Hills, Calif.: Golden Trailer Awards. PR Newswire. May 9, 2018. Archived from the original on May 11, 2018. Retrieved May 9, 2018. ^ McNary, Dave (May 31, 2018). "'Black Panther' Wins Top Prize at Golden Trailer Awards". Variety. Penske Media Corporation. Archived from the original on June 1, 2018. Retrieved May 31, 2018. ^ Xu, Linda (2018-11-15). "'Hollywood Reporter,' 'Hollywood Music in Media Awards: Full List of Winners". Retrieved 2018-11-16. ^ Hipes, Patrick (2018-11-27). "Humanitas Prize: "Black Panther", "This Is Us" Among Nominations". Deadline Hollywood. Retrieved 2018-11-27. ^ French, Alan (2018-12-26). "2018 Music City Film Critics Association (MCFCA) Nominations - 'Mary Poppins' and 'A Star Is Born' Sing Loud • AwardsCircuit - By Clayton Davis". AwardsCircuit - By Clayton Davis. Retrieved 2018-12-27. ^ ""The Hate U Give" Tops 2018 Indiana Film Journalists Association Awards". Indiana Film Journalists Association Awards (Press release). December 20, 2018. Retrieved December 17, 2018. ^ "'ROMA' AND 'THE FAVOURITE' TIE FOR KANSAS CITY FILM CRITICS' BEST FILM". Kansas City Film Critics (Press release). December 20, 2018. Retrieved December 16, 2018. ^ Hipes, Patrick (2018-11-27). "2018 Sierra Award Winners". Las Vegas Film Critics Society. Retrieved 2018-12-14. ^ Xu, Linda (December 27, 2018). "2018 Awards (22nd annual)". Retrieved December 27, 2018. ^ "PFCS Awards - 2018 - PHOENIX FILM CRITICS SOCIETY". Retrieved December 18, 2018. ^ "2018 Nominees". November 28, 2018. Retrieved November 29, 2018. ^ Aziz, Neha (March 18, 2018). "2018 SXSW Film Festival Announces Audience Award Winners". South by Southwest. Archived from the original on September 3, 2018. Retrieved April 11, 2018. ^ Sasha Stone (December 10, 2018). "Toronto Film Critics Announce Winners" (Press release). Award Daily. Archived from the original on December 9, 2018. Retrieved February 6, 2019. ^ "2018 WAFCA Award Winners" (Press release). Washington D.C. Area Film Critics Association Awards. December 3, 2018. Archived from the original on December 3, 2018. Retrieved December 3, 2018. ^ "World Soundtrack Academy announces first wave of nominees for the 18th #WSAwards". World Soundtrack Academy. August 13, 2018. Archived from the original on September 3, 2018. Retrieved September 3, 2018. Wikimedia Commons has media related to Isle of Dogs (film).